The dirty air is drawn in through the arm into the filter housing where it hits the flow distribution plates and changes direction. Then the air flow goes upward which causes the heavier particles to drop out of the air flow before hitting the filter. The remaining fine dust and fumes go through the filter cartridge and are filtered out. The clean air is exhausted through the exhaust silencer. The pulse cleaning system cleans the cartridge and causes dust to fall into the collection tray which can be emptied. The filter elements are horizontally loaded, the filter media is high efficiency Nano-web with fire retardant treatment in case of sparks which may pass into the fume collector. The filter media ensures the dust cleaning efficiency and prolongs the service life. 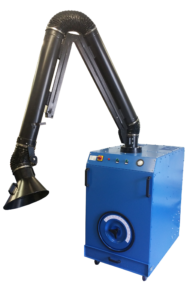 The portable welding fume collector is a low noise, high efficiency and high air flow unit. The unit comes on lockable wheels for mobility around the facility. The unit comes complete with in-built reverse pulse cleaning ability. Simple control panel provided for ease of operator use.